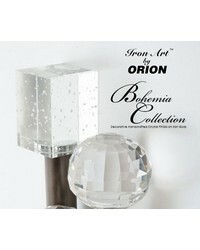 Sparkle and shine with crystal curtain rods and finials that feature the beauty of faceted hand cut crystal. The curtain rods come in a variety of metal finishes that offer looks of brass, nickel, chrome and other beautiful coordinating colors. 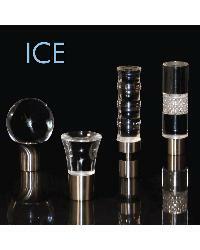 The curtain rods combined with the wide selection of crystal curtain finials offer choices for a contemporary to traditional looks. The curtain rods are available in a number of sizes and lengths for different sized windows, and also offer different bracket configurations for single and double window treatments. 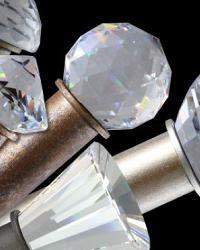 The selection of beautiful crystal finials feature Swarovski crystal finials to glass finials as well as plastic finials that offer beautiful variations in their crystalline designs. 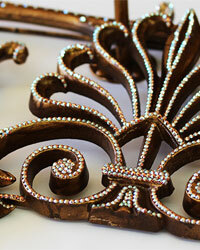 The Crystals collection of drapery hardware by Novel Curtain Rods offers great choices for managing window treatments with its crowns for the top of the window, to scrolls to help manage the fabric draping to the side as well as some gorgeous tiebacks all encrusted in a sparkling bejeweled ritzy look.